yeah, there are 10 big watermelons waiting to be drank by me and mango. we got them only for 30 cents kg. 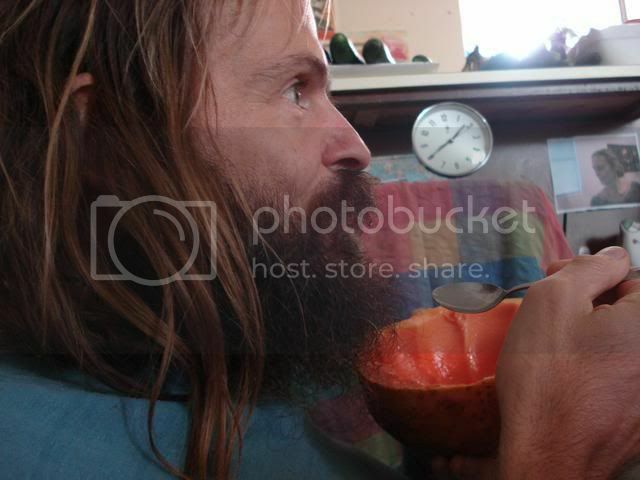 today mango enjoyed his fasting friday day, and i was enjoying watermelon drinks made for me by sweet mango. he take all seeds out before he blend the fruit. i also had big sweet & yummy paw paw as is, 2 avos, 2 small cucumbers and 3 tomatoes. it was cold sunny cloudy day, so i spend all morning in bed reading and after first blended watermelon drink i was euphoric singing what ever come to me, later on i was singing out the text of psychology book i was reading. around 11am i drop the book and i was sleeping for short time and soon after i jumped in to relaxing hot bath followed by refreshing and euphoric cold shower. mango had fun with spaceship and garden. rest of the day and night we spend together. we had lovely relaxing and peaceful day. someone took away citrus tree we replanted few days ago along with some other ones, so at 5pm we replaced the lost citrus tree with an apple tree. last night i rang and spoke with my sweet mum. she look at me and mango in to her cards and she gave me very good reading. all positive. we also had long and great chat. sweet mango & sweet paw paw...yum!